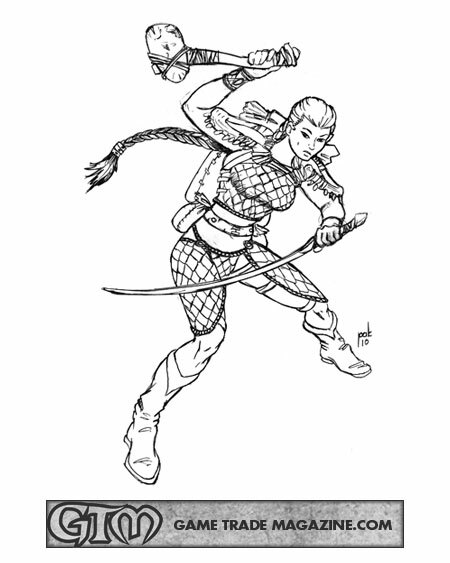 A while back I received a brief from Reaper describing a specific tiefling-like character they wanted to produce. 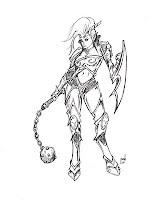 I designed some art based on the description of the character I recieved and submitted it for approval. After a little discussion, the art was approved and I began the sculpting process. As with any project, I print out references I receive from the client or from research I do myself. Sometimes if the size of the sculpt is particularly critical for whatever reason, I will print the art at "actual size" to the sculpt I will be producing to give me a good reference for size and proportion. The first session of the sculpting process involves attaching the armature to a base of some kind, in this case one of my homemade wooden clamps and posing it appropriately. Once the armature is clamped I will add some putty around the feet to secure it. In this case I did not because I was going to add an integrated base next. Then I begin blocking in an under layer to add strength and form to the armature. 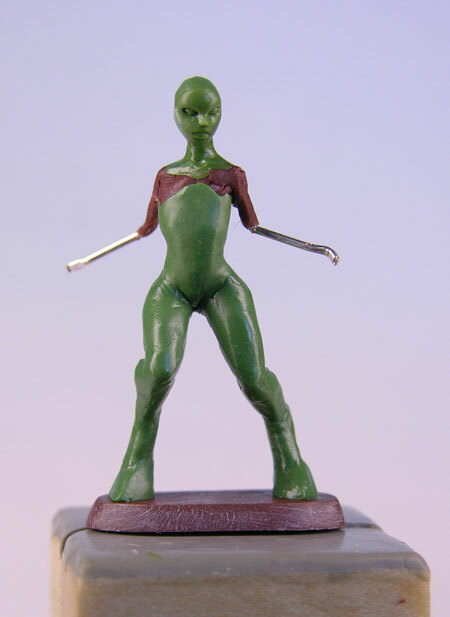 Check out the details here for information on how I like to make my armatures. Here I have used brown Aves Apoxie to give a rough form to the anatomy filling out areas of the pelvis and torso. The Apoxie is quite rigid when it cures and does not deform in the mold-making process. Recently I switched to a neutral gray colored Apoxie that I mixed from white and a small amount of black. Here I made a base from layered Apoxie I ran through my dedicated pasta machine. After the Apoxie slab cured I ground it into an oval and beveled it using my bench-top disk sander. I finished the surface using various grades of sandpaper to smooth it out. After that I drilled two holes corresponding to the wire from the armature and slipped them back into the clamp. I then secured the feet to the base with a bit of putty and a small lump for the skull then allowed that all to cure. The next session I sculpted the face and allowed that to cure. Sculpting a face can take twenty minutrs to an hour to "the putty has cured and I can't push on it anymore". Then I began blocking in the shapes for the torso and legs. 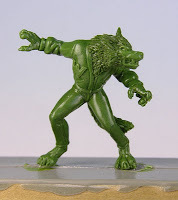 Once I was happy with this area and the putty had begin to firm a little as it cured I cut the armor ridges and details into the leg shapes. I also added a navel. Sometimes I forget to do that and have to poke it in after the piece has cured. Here I added her horns. 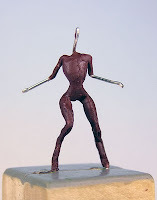 They were sculpted onto small pieces of wire using brown Kneadatite or "brownstuff". After they cured I went on to add the arms next following the same process as I did for the legs. They were then allowed to cure. 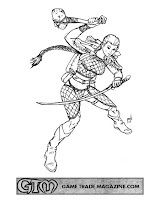 Over this I added the breast armor cutting the details into the ample lumps detailed in the character brief. The weapon and shield were crafted separately and then attached into place. Once the weapon was secure after the putty cured I sculpted the hand around the haft of the flail. Here are some more views of the finished sculpt. As you can see, it takes a lot of stages to make a full figure. One of the keys to a successful sculpt is knowing how to break down the project and knowing what is required for each step. When assessing any new piece I always begin by breaking the project into sections that can be completed within the time allotted, usually before the putty sets up too much to work with. 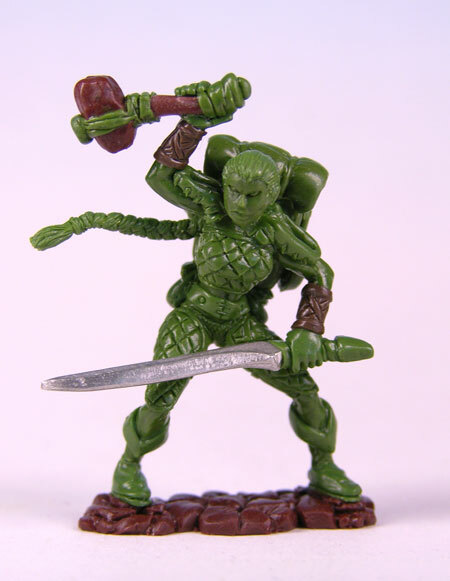 Reaper Miniatures updated their Greens Gallery with some of my sculpts. The Dwarven Forge Goddess Skadi made it to GenCon and back. She has been mastered now and is in the process of being painted. 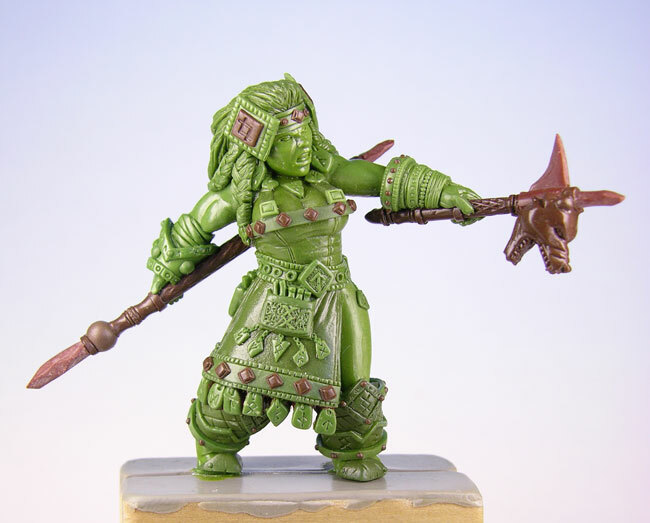 The girl with the braid was completed for the winner of Game Trade Magazine's Design Your Own Mini contest. I tried to adapt the character to the brief as much as possible. I designed the concept art based on the winner's description and then sculpted the model based on the art.